Mobile Monopoly 2.0 Scam – Do You Get to Pass Go? Based on the newer genre of mobile marketing, this program is meant to help business owners to market their wares and services to people via mobile devices. Research shows that there are far more smart phones and hand held devices in use than there are desktop computers. Even traditional laptop computers are slowly being phased out by users. To target these newer devices, mobile marketers have to have the right approach and the right tools. The mobile money code claims to have “cracked” this code. Unfortunately, the only thing this program is likely going to do is crack your bank account. In this review I am going to outline this product and give you some idea as to who the MM 2.0 program is for. Who is Mobile Monopoly 2.0 Intended to Help? Despite the level of training involved here, Mobile Monopoly 2 is not meant for beginners as it is for those with a bit more experience in the Internet marketing world. There is a requisite knowledge that is assumed within a lot of the video training so if you have no idea what terms like CPA, Instagram, Affiliate Marketing, and PPC mean, then you may be a bit over your head with Mobile Monopoly. You may also want an advertising budget. Much of the training is focused around paid techniques, with one being mobile advertiser AdMob which requires a minimum deposit of $50 for ads. So just something to consider before you get involved. Yes, paid advertising can work, but do remember that it is paid and comes with the risk of your money. The Tools and Training You “Kind Of” Get Access to…. These sections compromise over 90 training videos (with PDF downloads) that are available for you to view on the Mobile Monopoly 2 website. Live training is also scheduled for a wide variety of topics, but since the launch of this product and the slowing popularity of it, these have become less and less regular (to the point of not taking place at all). There are also tools that include software that allows members to create squeeze pages, combine webinars with real time, mobile traffic and more. However, is all the training you need really included? Unlike my top ranked product, you are NOT going to get everything in an “all inclusive” manner. If you are expecting to pay $49 and get the full meal deal, you are mistaken. You are going to get access to the core Mobile Money, but there are add on membership costs ($67 per month) to get additional training. 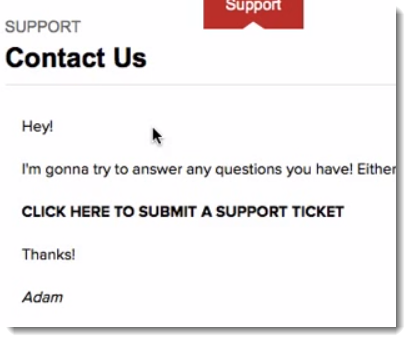 Can You Expect Support Directly from Adam? Every member gets a personal dashboard when they sign up. From this dashboard, they can access and manage their account plus other pages from the site including “Support”. The support system is a ticket based system and it goes to a centralized support system, not actually Adam himself. Unfortunately as the product is no longer popular (it was a launch and fizzle type of program), there is no money in supporting people within the community, so I would not expect a timely response and definitely do not expect a response from Adam himself (he sources out his support). What is the REAL Cost of Mobile Monopoly? The basic membership is $49 and that is what is sold to you when you initially sign-up on the sales page. However, this is just the start of the “upsell” parade that you can expect. After my initial login I got an upsell asking me to pay an additional $67 per month…WTH! Sneaky sales tactics are something that I don’t stand for and that will always lead me to a SCAM rating. That is when the alarm bells go off and tell me that a product is “bait and switch” style program. There are a number of additional upsells that range in price within the back-end so if you are expecting to spend $49 and to get everything, you are mistaken. Many of the techniques taught are also PAID, so you will be required to have a budget to join this program, and my recommendation is that you have at least $500 for things like PPC, Mobile Advertising, and App Development. I don’t agree with the upsell strategies implemented within Mobile Monopoly 2, but it is becoming all too common of a practice in this age of “guru” swindlers that we are living in. Just don’t expect your initial $49 payment to take you very far. My final opinion of Mobile Monopoly 2.0. Overall, I found the training to be quite good within the paid member area of this system. It targets the mobile marketing industry from a pretty straightforward angle and those that implement the techniques that are taught could definitely achieve some success. Just don’t be fooled by the folks out there promoting this program claiming huge profits in their first week, they are doing this so that you buy the program through their affiliate links. The part that threw me off of MM2.0 was the fact there were so many upsells and downsells within the program and there is an expectation that you are going to have to have an advertising budget in order to get rolling wth over 50% of the marketing techniques taught. To me this should be clearly explained on their sales page (which is just a video promo) and not pushed to you after the fact. VERDICT: LEGIT, but on the lower end. TOO MANY upsells & requirement for an advertising budget. Want to See What My #1 Ranked Product Is? If you have an questions or comments or you would like to add your own personal feedback of Mobile Money 2.0 program or the Beast Mobile membership, I would love your feedback within the comments section below. Your article is right, these type of online training products come and go, there is not long term training product for newbie that I have found outside of Wealthy Affiliate. They have huge number of refund rate, those who have very low budget to start their business online will be overwhelmed within the back end up this program because most fot he marketing techniques discussed are paid. Those who are already doing paid advertising then I believe this is Ok for them and as they can learn from expects in mobile advertising. Thx Kyle once again an informative delightful read.I thought that website was giving me a confusing headache at the time.It’s nice to know your not crazy. Like most people, I think people are growing tired of the video only sales pitches. No substance, just a bunch of useless hype. One thing that I learned early on in the marketing world is that he best marketer is the one that offers value before they require you to spend a dime. That is NOT what is happening online and unfortunately most of the self proclaimed gurus probably could not offer much help, that is why they are hiding behind videos and hype driven sales pages. Interesting post, I thought 70 out of 100 was generous. I, too, had alarm bells going off as I read and as a fairly new person online I think I might have been easily convinced that I needed the upsells to be truly successful. I have seen a few other “opportunities” out there for mobile marketing programs but have never been convinced that they could be successful; although phone apps are all the rage and I use a number of those myself. Thanks for another great review. Yeah, the chances you one reaching success with this program is very limited, in particular if they don’t have an extensive experience in the marketing world…and if that is the case, they probably know most of the techniques taught anyways. The reason it did get a 70 rating is because the delivery of the information was pretty good, albeit it a little scattered. People need to understand that a phone is just another medium in which people are connecting to the Internet and you still need to understand how to market online in order to succeed. 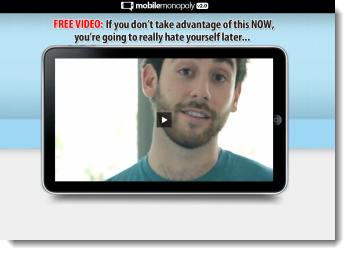 There is NO marketing training within Mobile Monopoly which is a significant flaw. I’m quite surprised this one ranked a 70/100. I heard the name, and immediately thought, “lame!”. I guess you can’t judge a book by it’s cover. To tell you the truth, most of my sites are not optimized for mobile, and though “mobile money” is something that seems to be hot right now, I really don’t have a clue about it. I guess I don’t really buy stuff from my smartphone and don’t own a tablet, so it’s not something I can relate to. But according the ‘the numbers’, it seems that a lot of people are doing it. I guess I can get the tablet thing – I can see people shopping on it. So the deal with this program – are they teaching you how to make a ‘squeeze page’ and get people to it via paid ads? Or was it just doing CPA & affiliate marketing for mobile? The information they are teaching is by no means anything new nor will it be anything new to you Nathaniell. It actually does not teach about optimizing your site for mobile, rather it is more into the paid side of mobile using Ad Mob. As I said, the training is quite scattered and although it is solid, it doesn’t really give anyone a concise plan to earning money within the mobile world. It is missing the key element, marketing. Thanks Kyle, I have always wondered why they hype this stuff given that choosing a mobile compatible theme in WordPress gets you mobile sales anyway! Just check the splits in Google Analytics. I am seeing more and more hits from mobile devices but over 80% of sales still come from desktops/laptops rather than the tablets and phones. Exactly Stephen, they were attempting to cash in around all the hype relating to mobile. Within the product they are even trying to push people to create apps..that is a huge undertaking and once you have an app, ALL of the work is still ahead of you. You have to get approved. You have to test and have a programmer hired to fix all the bugs as they come up and as the iOS platform evolves…and you have to market. As you said, most frameworks these days are supported on mobile (like many of the responsive WordPress themes), so marketing your websites marches on as per usual.